First day of fall 2015 starts the season of fashionable gray! Czech artistic hairdressers associated in the prestigious Association of Haute Coiffure Française introduced a new original collection – EMOTIONS hairstyles spring and summer of 2016. The association of hairdressers Haute Coiffure Française in the Czech Republic, or the Czech section of this prestigious international association uniting the world’s leading hairdressing salons, introduced a new collection – EMOTIONS hairstyles spring and summer of 2016. “Artistic hairdressers HCF present a collection that combines feelings of everyday human life. It’s a special kind of experience that makes us emotions and gives us a certain amount of excitement,” says Irena Vavrušková, HCF CR president, i.e. High hairdressing art in the country about the collection that includes two big artistic hairstyles and two small fashion shows’ hairstyles. Haute Coiffure Française CR – EMOTIONS hairstyles spring and summer of 2016. “Our art team of hairdressers HCF presents a special interesting techniques for new combing details and elements for spring / summer of 2016 season. We worked mainly on structures and volumes hairstyles in this collection,” adds Misha Čadková, the Artistic Director, in contex of new EMOTIONS hairstyles spring and summer of 2016 . Petra Měchurová portrayed te first great artistic hairstyle called Melancholia. Our attention is attracted by gentle blue-green color. The second artistic hairstyle called Anger in black-red colors was portrayed by Gabriela Kejmarová. Irena Vavrušková was focused on the shape of the small haircut for catwalks, small elements, clear knitting technology of delicate frills, delicate interweaving with a tiny volume of hair and powder clean styling. The second catwalks hairdo, created by Jarka Čechová, excels with high bangs and lighten knot on the top of the head, where is the emphasis on the shape and detail of individual strands. 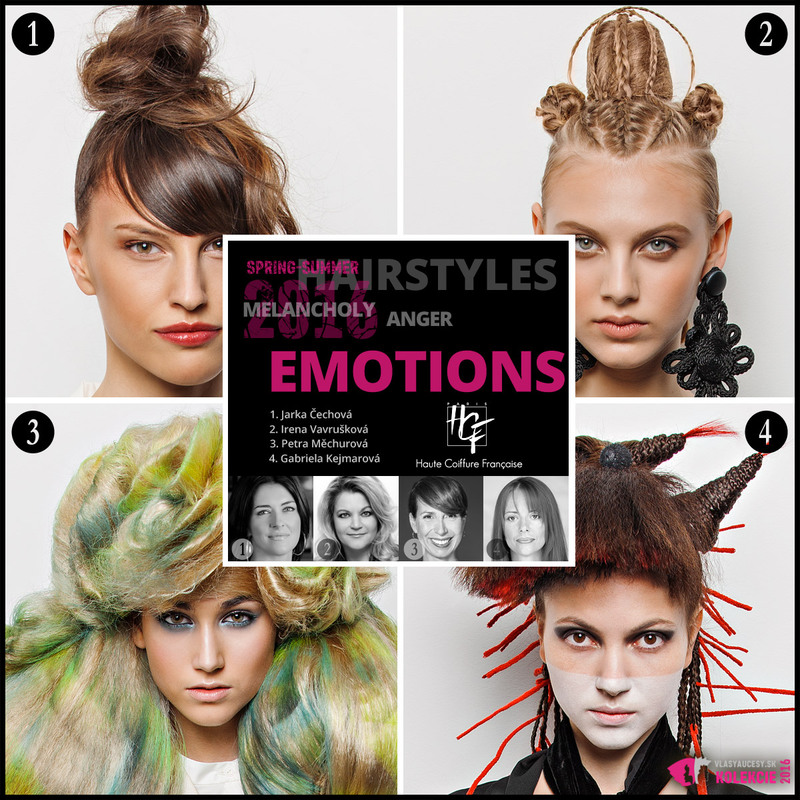 HCF EMOTIONS hairstyles spring/summer 2016 – Jarka Čechová.